Heat oven to 350°F. Cut cookie dough into 4 equal pieces. Work with 1 piece of dough at a time; refrigerate remaining dough until ready to use. Cut 1 piece of dough into 10 equal portions. Using 1 portion for each cookie, shape dough into 1-inch ball for body, 1/2-inch ball for head, 4 (1/4-inch) balls for arms and legs, and 2 smaller balls for ears. Arrange balls to look like teddy bear shape on ungreased cookie sheet. Repeat with remaining pieces of dough, placing cookies 2 inches apart on cookie sheets. Bake 10 to 13 minutes or until set. Cool 2 minutes; remove from cookie sheets. Decorate as desired with icing. If using chocolate chips, cinnamon candies or candy-coated chocolate candies to decorate these cookies, place them on the cookies while warm from the oven so the decorations stick. 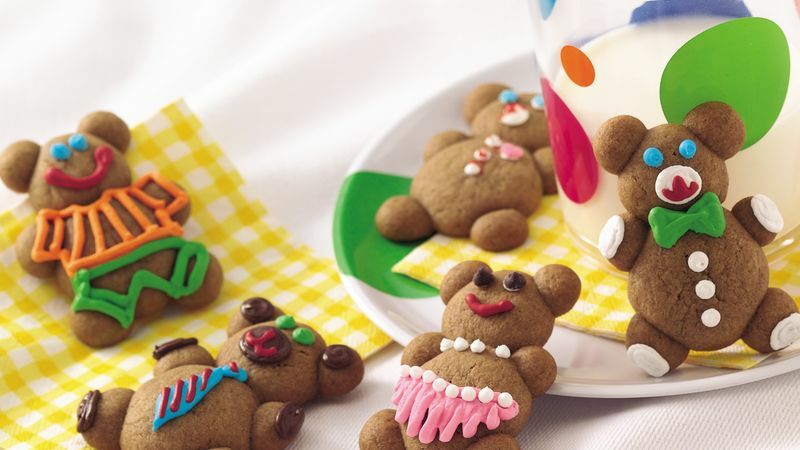 Add other decorations when the cookies are cool; attach with icing, or use the frosting recipe on the gingerbread cookies label.